The other day, I took this picture of my patient while performing a minimally invasive greater occipital nerve decompression (MIGONE). What is pictured is a substantial portion of the nerve in the back of the neck. You can tell where the nerve was "pinched." Look closely at the picture. The nerve changes color from a pink/red to a white/salmon color. The red region marks the area where this nerve was severely compressed, and actually caused physical damage to it. The tissue overlying it, mostly made of fascia (tight dense tissue), was involved in the compression. The good news, once the nerve has been freed, the pain usually goes away immediately. I saw this patient, two days after the surgery. This was her left greater occipital nerve, which correlated to where her headaches were the worse. On post op day number two, she had no more headache pain. All her pain at that point was associated with the incision (which was minimal). Occipital neuralgia is a real condition affecting millions of patients. Many options such as massage, injections, botox, medications, compound steroids are other options. 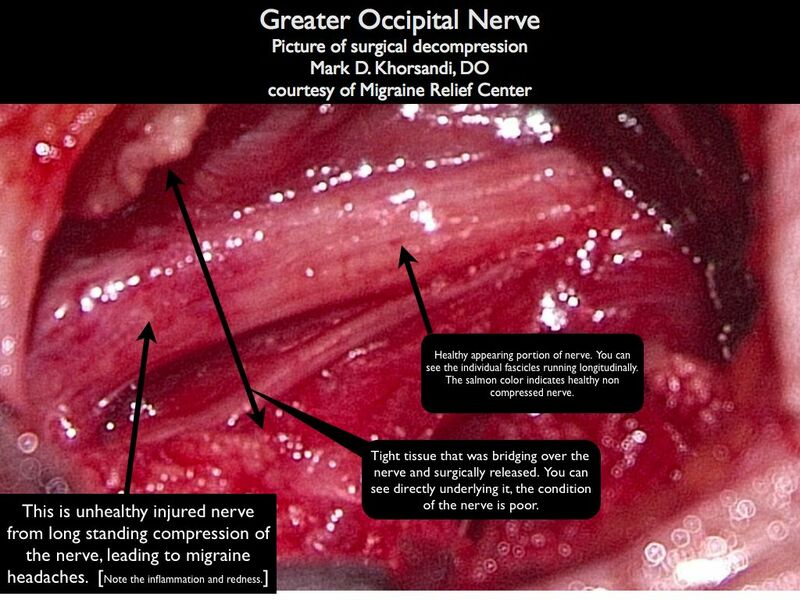 Patients failing to get relief should consider greater occipital nerve decompression. It is a same day procedure which I perform. For more information and to determine whether your migraines are due to occipital neuralgia, contact us for a consultation.